Helping to bring a railroad simulator to life. 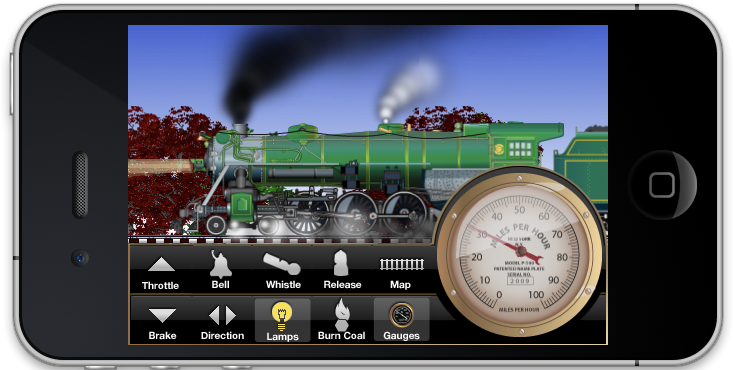 Grand Junction Railroad is a delightful locomotive simulator that places users at the controls of classic steam locomotives as they race down the track and build a railroad empire. Designer and developer Atom Media found themselves in need of assistance implementing their app to the level of performance and polish they envisioned for the app store. Enharmonic provided software architecture consulting and OpenGL / C / Objective-C performance optimization services. Cut the application’s load time by ~75% through optimizing the use of image data through encoding textures into a format that the video card can load directly without using much CPU time. Cut the application’s memory usage by ~50% by generating OpenGL textures that include many tiled images (sprite sheets). Cut the application’s overall CPU usage significantly by updating certain UI elements only at strategic moments. Worked with the client’s developers to add native UIKit controls for preferences, in simulation train controls, and in settings. Previous to Enharmonic’s involvement, the application used OpenGL to render all UI, including buttons and other controls.